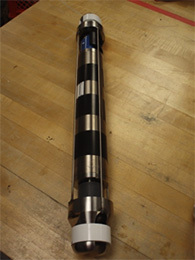 The GeoMICROBE sled in deployment. Image courtesy Brian Glazer. Members of the C-DEBI community have access to a wide range of experimental, analytical, sequencing, field, sampling, and computer equipment that is housed in the laboratories of individual faculty members, in shared departmental facilities, or in core facilities and centers. 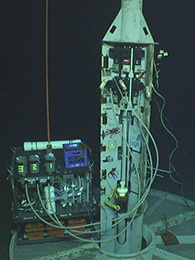 Here, we list some of these laboratories and facilities, highlighting those that are most germane to the exploration of the subseafloor biosphere, but omitting some that are common at many institutions. We first list the equipment available at USC, starting with core facilities and centers, followed by shared facilities in the Departments of Biological Sciences and Earth Sciences, and then laboratories of individual faculty members, including C-DEBI Director (Amend) and several Collaborators (Heidelberg, Corsetti, Nealson, El-Naggar, Meng). C-DEBI members also have access to facilities and laboratories at our partner institutions; here, we list some of the most pertinent resources for subseafloor biosphere research available through ExCom members Huber (WHOI), D’Hondt (URI), Fisher (UCSC), and Wheat (UAF). C-DEBI maintains a core goal of implementing effective pathways for facilitating intellectual exchange of knowledge, information, and application of new technologies to its various partners and the community at large. This philosophy includes the establishment of an open access policy for all of the new tools, innovations, laboratory techniques and software developed by C-DEBI. 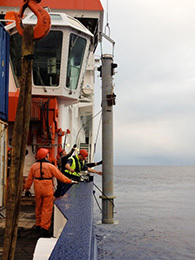 At the start of C-DEBI most of the technological advances were in the form of hardware, driven by a wave of sea-going operations that expanded the bounds of subseafloor observation and sample collection. C-DEBI is continuing its sea-going operations, but is now also expanding its developmental emphasis into laboratory advances. Below we list each of the new developments through C-DEBI. Finished developments are described in published literature, some complete with machine and electrical drawings. Other developments are ongoing by research scientists, engineers, students, post-doctoral fellows, and commercial enterprises. Some of the developments are now available commercially and others have potential commercial value. Various C-DEBI inventions at use at North Pond. A. DEBI-DOT before deployment, B. GeoMicrobe Sled at North Pond CORK 1383C, and C. Deployment of CORK-LITE at North Pond. Here, we list additional partnerships (in alphabetical order) outside of our primary partner institutions that provide experimental and educational expertise, and facilities that we have used in the past and will rely on in the future for investigations of the deep biosphere.